Dinner parties have pretty much faded into the past, and I don’t know if that’s a good thing or a bad thing. I mean the kind of dinners where you light the candles and serve a three- or four-course meal you have spent hours preparing. I used to have dinner parties every other month or so, and attend friends’ dinner parties about as often. They were my favorite way to socialize: more intimate than a party, with good conversation and a lovely feeling of well-being at the end of the night. Those evenings could be magic. Now meals with friends, when they occur at all, are likely to be less formal — pizza on the grill or a last-minute pot luck. Spending two days cooking is physically difficult and expensive, too. Ah, but the rewards. I was reminded just how much I missed dinner parties when I had a handful of girlfriends over last week. I took a few shortcuts — I bought pate instead of making it, for example — but I still managed to offer a luxurious dinner of braised lamb shanks over polenta and individual Grand Marnier soufflés — plus homemade bread and a mesclun salad with bacon and toasted walnuts that served as a first course with the pate. A leisurely dinner of good food helps the conversation flow. We talked and laughed for hours. And then I had delicious leftovers the next day. Of course, to accomplish all this I had to start cleaning the house two weeks out, and start shopping and cooking well before the event. The morning of the dinner, as I was scrounging for cloth napkins in the hall closet, I remembered why I don’t entertain like this anymore. It’s a lot of work. Much later, while sipping the last of the pinot noir and swapping stories, I remembered why I used to entertain like this. There’s no better way to enjoy the company of friends. 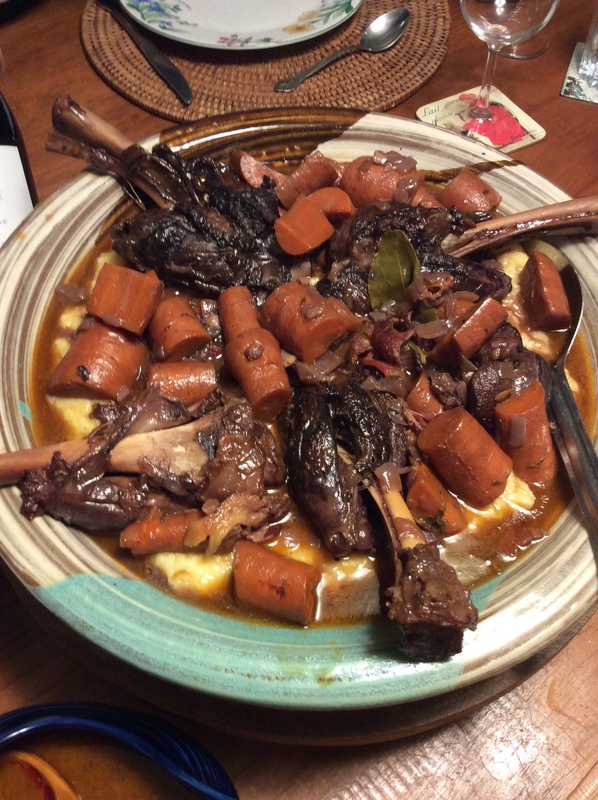 The lamb shanks, with their rich, winey broth, were inspired by a meal my friend, Linda, cooked for Tony and me in France. I assembled and partially cooked them the day before the dinner, refrigerated them in their pan, and cooked them an hour longer just before the meal. Fry bacon in a wide, deep, lidded pan until crisp; drain on paper towels. Trim any excess fat from the shanks and season very well with salt and pepper. Brown on all sides over medium-high heat in the bacon fat. Remove from pan and set aside. Reduce heat to medium and sauté onions and garlic in the fat remaining in pan, adding a splash of vegetable oil if necessary. Stir in carrots and tomato paste. Add thyme and bay leaf. Return lamb shanks to pan. Increase heat to high and add beef broth. Bring to a boil and boil for a couple of minutes to reduce slightly. Add wine. Bring to a boil, reduce heat, partially cover and simmer for 2 to 2 1/2 hours, until lamb is very tender. Serve with polenta or potatoes. Makes 4 servings. Polenta is a dish that a requires a lot of stirring in the kitchen when you’d rather be having cocktails or eating an appetizer with your guests — unless you have a way to make polenta in advance and keep it warm without solidifying (the polenta, not you) into a giant hunk. Here’s how: Make the polenta as usual, adding extra water per directions if you intend to serve it soft. I stir one cup of cornmeal and a teaspoon of salt all at once into 5 cups cold water, then cook and stir it occasionally over heat adjusted to allow the polenta to sputter very lazily. When the grains of cornmeal are soft and taste cooked, stir in 6 tablespoons butter and a cup of grated Parmesan. To keep the polenta from setting up, place the pan of polenta in a larger pan of hot water over low heat. It may be kept warm an hour or more in this manner. Beat the polenta with a spoon before serving. Roasted delicata squash, chicken skewers with sweet soy sauce; no-knead bread, mousse pate with a salad of greens, toasted walnuts, bacon and vinaigrette, braised lamb shanks in red wine over polenta, and individual Grand Marnier soufflés; chocolate chip cookies; sirloin steak salad with roasted butternut squash, toasted walnuts, shaved onions, feta cheese and vinaigrette; eggs over hard with thin-sliced Swiss cheese on seeded bread. Thin-crust veggie pizza from Earth Fare; hamburger steak, mashed potatoes and a cornmeal muffin at Cracker Barrel; beef fried rice at Giant Eagle Marketplace restaurant in Cuyahoga Falls; two Taco Bell tacos. Thank you so much for sharing this link. I came to Akron in 1978 and faintly remember the Summit Mall Stouffer’s. I regret I didn’t have a chance to eat there. For years, though, as the newspaper’s food writer I was peppered with requests for recipes from the chain, which I see from your referenced article started in 1922 as a coffee shop in the Arcade in Cleveland. Dissolve cornstarch in cold water in a saucepan. Add boiling water and cook 3 to 4 minutes over medium heat, stirring constantly, until thick. Dissolve paprika in hot water; add to cornstarch mixture and cook 1 minute longer. Stir in sugar, salt and mustard. Strain mixture to eliminate any lumps, if desired. Whip hot mixture on medium speed of an electric mixer while gradually adding oil alternately with vinegar. Beat in onion juice. Add garlic clove, cover and refrigerate 24 hours to blend flavor. Remove garlic before serving. Makes 1 quart. We raise and butcher our own chickens and use the necks, butts and wingtips to make broth to can. I skim off the fat before canning. Could I use the fat to cook potatoes? As long as the moisture has been eliminated — the fat should solidify when chilled — you can fry food in it and it will taste very good indeed. Too bad you don’t raise ducks. I’d give a lot for some duck fat. One more vacation post and then I’ll stop, I promise. But I have to tell you about the clever way Parisian butcher shops make rotisserie chicken. Yes, that trend has travelled across the Atlantic. I didn’t see any spitted chickens in supermarkets, but some charcuteries — meat/deli shops — are cashing in by setting up free-standing, glass-enclosed rotisseries outside on the sidewalk. The birds are spitted three or four across in three or four vertical rows with — here’s the genius detail — a pile of potato chunks at the bottom. As the birds cook, they drip their delicious juices onto the garlic-flecked potatoes below. The birds turn golden brown. The potatoes turn golden brown. What a grand idea. I don’t have a rotisserie, so I jerry-rigged the next-best thing. I tumbled a bunch of halved baby potatoes with coarse sea salt, chopped garlic and olive oil on the bottom of an oblong baking pan. I placed a wire cooling rack over the pan and roasted the chicken on top. 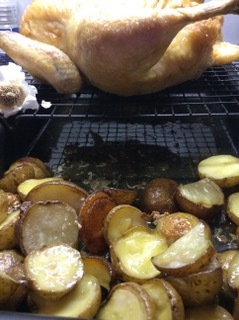 Just as in the rotisseries in Paris, the juices dripped down and flavored the potatoes. I coated the raw potatoes with olive oil so they wouldn’t stick to the pan and burn before the juices began to flow. It worked perfectly. 1 roasting chicken, about 4 1/2 to 5 lbs. Preheat oven to 375 degrees. Remove packet of giblets, if there, and wash chicken inside and out. Trim any large pieces of fat around openings. Blot chicken dry with paper towels. Rub all over with olive oil. Rub all over with about a tablespoon of salt. Set aside. Place the potatoes in a 9-by-12-inch baking pan. Drizzle with olive oil and toss to coat evenly. Use just enough oil to gloss the potatoes. Season with salt and toss again with garlic. Place a cooling rack over the baking pan. It should be large enough to rest on the rim of the pan. Place chicken on rack. Roast at 375 degrees for about 20 minutes per pound, or until an instant-read thermometer registers 165 to 170 degrees when inserted in the thickest part of the thigh. Let rest 15 to 20 minutes before carving. Serves 4. A steak salad platter of pan-grilled top sirloin over mixed baby lettuces with sautéed mushrooms, toasted walnuts, onions and roast beets with feta cheese and vinaigrette; roast chicken over garlic baby potatoes; Japanese chicken and rice soup; sugar-free pumpkin pie. Chicken lo mein, egg roll and fortune cookie from China Star in Akron; lamb Bolognese over pasta and hamburger with blue cheese (shared) at Wolf Creek Tavern in Norton; half of a Subway Cubano sandwich; two cheeseburgers and a few fries from Swenson’s. 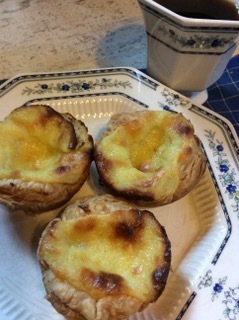 While enjoying custard tarts in Portugal three weeks ago, I wondered why they resembled a sweeter, more vanilla-flavored version of the Hong Kong egg tarts which culminate my dim sum feasts at Li Wah in Cleveland. Simple: The Portuguese brought them to Macau, and local chefs complimented their Western visitors by adopting the recipe. Now I know that the French have done the same, although using pastry cream seems tres Gallique. Thank you for providing more background on those delicious custard tarts. I have had poor versions at the Chinese buffets Tony drags me to. I’ll have to try the real thing at Li Wah. I’m a big fan of The Great British Baking Show on PBS. The last challenge I watched was for patisseries. NEVER heard of this before, and lo and behold, here you are giving us a recipe for the custard tarts. Your recipe looked a lot easier than theirs. Making the “creme pat,” and Mary Berry said the store puff pastry is excellent and making your own is so much work. I’m going with Mary Berry and Jane Snow. And of course Paul Hollywood, the hunk, but I digress. Thanks again for the recipe, and enjoyed your blog. I am glad you wrote about The Great British Baking Show. I have heard so much about the program and have been tempted to binge-watch the series on Netflix, but I am afraid I would end up making and eating a lot of the desserts. My hips can’t take it. For that reason, I avoid it. I like hearing about the show, though, so thanks. Maybe I’ll Google Paul Hollywood. Tony went native in France. He embraced the culture as if he were coming home, even buying a straw fedora like the men wore in the rural chunk of France we visited. The hat is stowed for the winter now, and my husband seems a lost soul as he wanders supermarkets in search of decent cheese, a dry rose, a passable loaf of bread. My burden is a carb hangover. 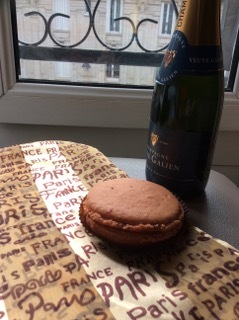 I couldn’t resist the baguettes and macarons, and now I’m paying for it. I crave bread. I crave sugar. I crave those addictive little custard tarts I bought at an outdoor market at Place Monge in Paris. They were so good I hid them from Tony and ate both of them myself. Don’t judge me until you taste one. The mini tarts are sold at cheese stores and patisseries all over Paris. They have a puff pastry crust, although it’s not allowed to puff, and a very dense, sweet vanilla custard filling that is blistered in patches on the top. The tarts are actually Portuguese, I learned, although the French have enthusiastically adopted them. Last weekend, in a final sugar splurge, I made a dozen of the tarts to both enjoy and to atone for swiping Tony’s share in France. I used an internet recipe from the French Cooking Academy, converting the grams and liters to ounces and cups. The tarts were as good as I remembered. The tarts are tiny — they’re made in cupcake tins — and easy to assemble if you use frozen puff pastry. But because the ingredients are few, quality is important. Use a real vanilla bean to flavor the custard, and don’t downgrade the cream to half and half or whole milk. The recipe makes enough custard — actually, creme patisserie — to fill about 24 tart shells. I thought that was an unconscionable number of tarts for two people, so I made just 12 tarts and spooned the remaining filing into two custard cups to eat as very rich pudding. Tony loved the tarts so much I had to fight for my share. I’m glad I didn’t tell him about the leftover custard. Remove pastry from box and thaw at room temperature for 45 minutes while you make the filling. In the bowl of a mixer, beat the egg yolks and sugar until they turn a very pale yellow. By hand, gently stir in the cornstarch. Heat milk and cream on medium-high heat in a medium-sized saucepan. As they heat, split the vanilla bean with a sharp knife and scrape the seeds into the milk mixture. Add the vanilla pod and bring to a boil, stirring occasionally. Remove from heat. Remove the vanilla pods and slowly whisk into the yolk mixture in a thin stream, beating rapidly to prevent the egg yolks from cooking. Return to saucepan. Whisk and cook until the custard comes to a boil. Continue to whisk and cook for 1 minute, until custard is thick but still pours in thick ribbons. Remove from heat and place plastic wrap directly on custard. Cool to room temperature while fashioning tart shells. Preheat oven to 375 degrees. On a lightly floured board or counter, unfold one sheet of puff pastry. With a floured rolling pin, roll to about one-eighth-inch thickness. With a 4 1/2- or 5-inch circular biscuit cutter or glass, cut 4 circles. Ease them into a buttered 12-hole cupcake tin. Re-roll half of the scraps. Cut one more round and fit it into another cupcake hole. Set aside remaining scraps. Repeat with remaining sheet of puff pastry. You should have two empty cupcake holes. Re-roll remaining pastry scraps from both sheets of pastry. Cut two more rounds and fit them into the remaining cupcake holes. Spoon custard into the tart shells to fill no more than half way. Refrigerate the remaining custard to eat later. Bake tarts at 375 degrees for about 45 to 50 minutes, or until filling puffs, then subsides, and turns dark in spots. Cool. Serve tarts at room temperature or chilled. Makes 12 tarts. The former New York Times restaurant critic and Gourmet magazine food editor will give a free lecture at 6:30 p.m. Oct. 25 at the Canton Palace Theater. Afterward she will sign copies of her 2014 novel, “Delicious.” Reservations are required from http://www.starklibrary.org. Lists of the best food memoirs of all time are a thing now. I’ve seen lists on Amazon, Pinterest and Food52. 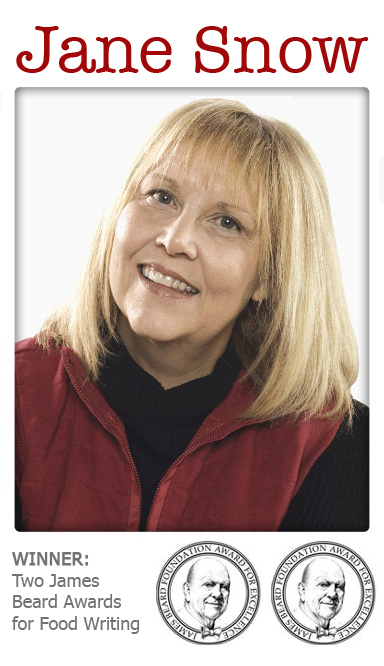 A Canadian friend, former Toronto Star food editor Marion Kane, has an interesting list. 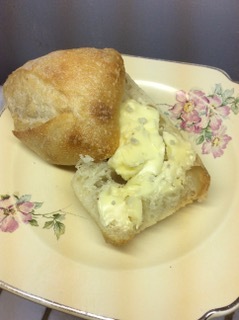 Check it out here: https://www.marionkane.com/recipe-2/im-eating-delicious-food-memoirs/. I segued from reading mostly fiction to mostly memoirs and biographies a decade ago. My latest reads include “Mastering the Art of French Eating” by Ann Mah, “Medium Raw” by Anthony Bourdain and “Hunger: A Memoir of My Body” by Roxane Gay. “The Art of Eating” by M.F.K. Fisher; “Born Round” by Frank Bruni; “Kitchen Confidential” by Anthony Bourdain; The Tummy Trilogy (three books) by Calvin Trillin; “Garlic and Sapphires” by Ruth Reichl; “Heartburn” by Nora Ephron, and “Blood, Bones and Butter” by Gabrielle Hamilton. Pumpkin pie; honey-mustard pork chops, stir-fried bell peppers and olives with Szechuan chili oil; cornbread, venison-lentil chili; soft-scrambled eggs with truffle salt, buttered toast; French custard tarts; baked leeks, carrots and chicken tenders with a mayonnaise-mustard crumb topping. Pork chow mein with crispy noodles from Chin’s Place in Akron; pad Thai at the stir-fry bar at Giant Eagle in Cuyahoga Falls. 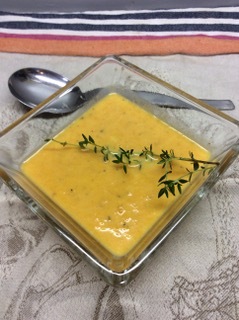 On a chilly fall Sunday morning I made your Carrot-Leek with Thyme Soup. Although my carrots were not freshly dug from the ground, the soup is/was just delicious! I will definitely grow carrots next year in the garden. Sharing today with friends as we gather around my new Amish table… so lovely!. I especially enjoyed your writings while in France. Lucky you! Thank you for the feedback on the recipe. That’s nice to hear. I’m also glad you enjoy hearing about my trip to France, because I’m still dishing about it. The trip was my first to France in almost 20 years. The last time I went (with my mother), the Eiffel Tower was not surrounded by wire fences patrolled by gun-toting police, the black swans were still in the ponds at its feet, and the lines to enter the museums and Notre Dame were not a couple of blocks long. But the food is still good and the city is still impossibly romantic. Before I remarried, I had planned to spend three months in Italy when I retired. Two weeks in France with Tony seems like a fair trade-off.